Saffron is both tasty and expensive. In fact, I have seen it referred to as the most expensive spice in the world. Not sure about the veracity of this claim, but it is most certainly, the most expensive spice we buy. The spice vendor that we go through typically has it for about $18 per gram; in excess of $500 per ounce. Ouch. Now I understand that the process of harvesting the stigmas off of a specific type of crocus, drying it, and then shipping it around the world to my kitchen has some inherent costs. Unfortunately, knowing this does not stop me from crying out in financial pain when a recipe calls for saffron. 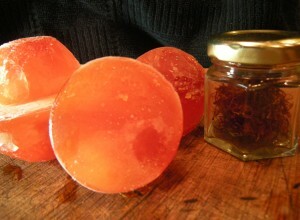 We use saffron a lot in Moroccan and other Mediterranean recipes and all cooks have to work within a budget. Saffron water to the rescue..well, somewhat…. This dish is one of my favorites among the many, many utterly tasty things that Brinn has formulated over the years. It is an outgrowth of her long fascination with Moroccan food and tagine cooking in particular. She typically serves these succulent, slow-cooked, chili and pomegranate coated chicken thighs with savory, oven roasted root vegetables and loaves of fresh street bread for dipping. 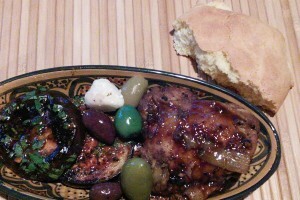 The photo to the left shows the chicken alongside another favorite; eggplant with charmoula. Garnishing with some olives and feta never hurts. If you are unfamiliar with tagine cooking, you might want to consider changing that. 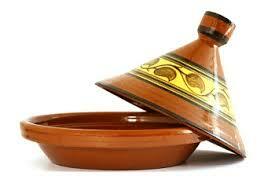 Tagines are two-part clay pots made famous by the Berbers in North Africa. These clay pots were designed to be used over charcoal or open flame and function as something between a steam roaster and a portable oven. They regulate the moisture of a dish and allow for long cooking times while managing to preserve really clean flavors. Around the house, we use the side burner of our barbecue or single burner butane stoves as a heat source. More details on tagine suppliers and how to use these really amazing pots next week, as it is a subject worthy of some detail, especially since there will be a lot of tagine recipes posted here in the future…. Got a nasty piece of fish you don’t know how to handle? Got a good piece of fish that you would like to have stand alone with class? This style of marinade and cooking levels the playing field and can, oddly handle both situations. Its also quick and idiot simple; how cool is that? I typically use cod for this dish, but the marinade handles fish ranging from mild tilapia to some seriously nasty mackerel. This marinade will work for the fish-shy among you and produce a reliable, lightly seasoned main dish with delicate citrus and floral overtones. The miso browns readily under the broiler and produces a piece of fish with a light tan, chewy outer surface. As the cooking time is short, the fish remains moist beneath the browned exterior. Perfect for eating over a some nice, succulent rice…. I have owned a grand total of 4 rice cookers in my life. At the time I owned them, I really liked each of them in turn and each has been part of a steady progression towards attempted perfection in rice preparation. I guess it is some bizarre, psychological thing for me; the rice I can cook in a simple sauce pan on the stove is perfectly acceptable. It should really be good enough, but each time I improve the quality of my cooked rice, it makes me happy. It is hard to exactly explain why, but properly cooked rice is a real treat and is generally worth the effort in my book. After my faithful Hitachi Chime-Omatic bit the dust, I spent about a year in limbo, cooking rice on the stove top; no worries…things were fine. As time wore on, I started cooking quite a bit of rice for sushi and really needed something to streamline the process. 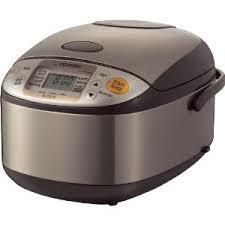 Enter the Zojirushi NS-LAC05XA 3-Cup Rice Cooker . After much research and agonizing, this is what I settled on and have not been disappointed…. We don’t typically have a lot of prepared sweets around the house because they are well, sweet, and we don’t really eat them that often. As a result, on the rare occasion that I do get a sweet tooth, I usually go begging and whining for Brinn to cook me something, since she is better at that baking thing than I am. That something that I crave is usually a brownie. Sort of my baseline sweetened junk food preference. Below is the latest iteration of the current favorite house brownie. While definitely not health food, it is really not tragically sweet. The combination of very dark chocolate and chili-based spices results in a rich, bittersweet morsel that is reminiscent of spice cake…but without the cake part….